I've been planning to make iced heart cookies since I saw these gorgeous leaves. This looks like an icing method that even I can manage! Anna pointed me to a recipe for "no fail" sugar cookies. This is the first time I have made cut-out cookies by rolling the dough between pieces of parchment and then chilling it. Now I'll never do them any other way. I'll even be brave and roll them a little thinner next time. I do love these thick sturdy cookies, though. I'm disappointed in myself for not getting these made over the weekend, when I had a Valentine to share them with. Whisk dry ingredients together in a small bowl. In a large bowl, cream butter and sugar until light and fluffy. Add eggs and extract. Mix well. Add dry ingredients to butter-sugar mixture a little at a time. Mix until flour is completely incorporated and the dough comes together. Place a glob of dough between two sheets of parchment paper. Roll it out to the desired thickness then place the dough and paper on a cookie sheet and pop it into the refrigerator. After it has chilled completely, cut into desired shapes. Bake on parchment paper at 350 degrees for 8 to 10 minutes or until just beginning to turn brown around the edges. Cool on wire rack. Makes approximately 2.5 dozen cookies, depending on size and shape. In medium bowl, stir together confectioners' sugar and milk until smooth. Beat in corn syrup and almond extract until icing is smooth and glossy. Add food coloring to desired intensity. If icing is too thick, add more corn syrup. 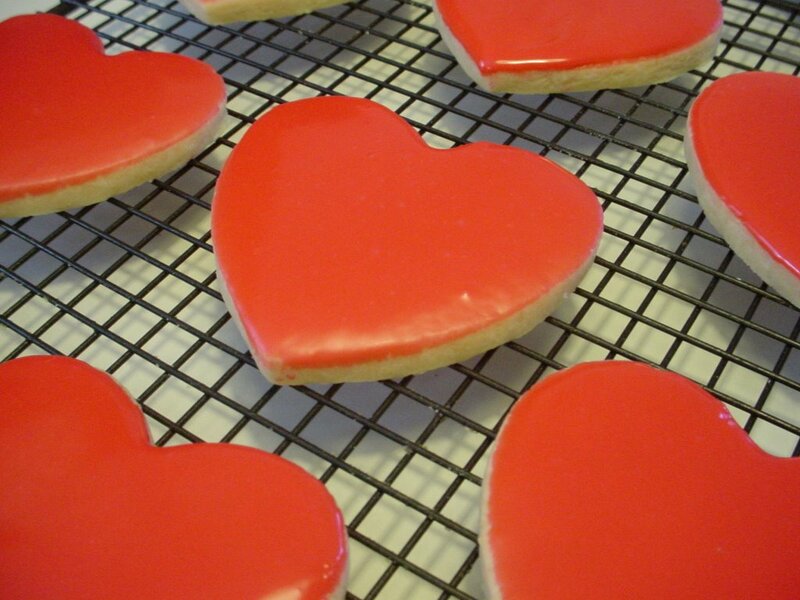 Dip fronts of cookies into icing, letting excess drip off, back into the bowl. Allow to dry overnight. Yum, love that almond extract! Gorgeous! Are they as good as they look? Those look great, Amy! Yum! Are you sure those aren't store bought?! They look absolutely perfect and yummy! Those are gorgeous!!! I'm glad that recipe worked out. Next time I'll go with that one rather than resorting to Nestle pre-cut sugar cookies. That picture brought a smile to my face! They are beautiful. Next time I make sugar cookies (which we often do at Christmas time, but I am not sure I can wait that long! ), I will use this technique. Thanks for sharing it. Pretty as a picture but so much better to eat. Lovely cookies. I just love that no fail sugar cookie recipe. It makes the best cookies and for decorating you can't beat it. yup sheri, they were as good as they looked! neener-neener-neener! Okay...I saw the heart cookies today and tonight got an urge to make them...I followed the directions exactly, except for one thing - instead of an egg, I used egg substitute. My dough turned out to be a batter. Seriously, was the consistancy of pancake batter. I added flour and stirred until it became thick enough. I chilled the dough, and when I went to preheat my oven, it shorted out on me...perfect timing, eh? (not to mention I just bought my stove last month) Anyway, the repair guy is coming tomorrow, so I cut out the hearts, wrapped in freezer paper and put it in the freezer. I am praying that they turn out right after all the "misadventures" I've had with them...but I was wondering...why would it have turned out so soupy? Is my mixer too powerful? Was it the egg substitute? Help! I'd like to use this recipe again, as it was so easy...but easy means nothing if they turn out way too heavy cause of the flour overdose...whattaya think? I'll cross my fingers and hope they turn out for you. My dough was exactly the opposite; it barely held together. I'm not a cookie expert, but my guess is that it was the egg substitute. I think on the carton, it usually says that 1 egg = 1/4 cup or 4T. But I think it probably should be about 3 Tablespoons. I used my KitchenAid, so I doubt it was a case of your mixer being too powerful. Amy dropped some of the cookies off at our house and pretty much made my four year old's day! Thanks Amy! The funny thing is, she kept saying how they tasted like cherry cookies. They were bright red, so I thought maybe she was being influenced by the color. I tried a cookie and knew right away she was confusing the almond with cherry. So the almond flavor is pretty strong (in a good way!). Thanks for the cookies.